Home / Board of Elections / CM / Daily Update / general election / News / Politics / voting / Voter registration deadline is tomorrow, October 12th! Voter registration deadline is tomorrow, October 12th! ALBANY, N.Y. -- The State Board of Elections today reminds all state residents to register to vote for the November 6th, 2018 general election. Mail-in voter registration forms must be postmarked by midnight October 12th and received by a board of elections no later than October 17th to be valid for the upcoming general election. Candidates for Governor, US Senate, State Comptroller, State Attorney General, the House of Representatives, the State Legislature, the State Supreme Court as well as many important local offices will be on the ballot this year. You can check the State Board of Elections' website (www.elections.ny.gov) or contact your local board of elections for more information. The voter registration form can be downloaded from our website: www.elections.ny.gov. You may also register online through the Department of Motor Vehicles at their MyDMV site. You can also register or find forms at most state and federal government offices in addition to finding forms at the post office or your local library. Residents who have moved to a new county within the state are reminded that they must re-register from their new address. Those who are currently registered and have moved to a new address in the same county should notify their county board of elections in writing of their move no later than October 17th. If you wish to change your party enrollment to participate in a primary in 2019, your change must be received by your local county board no later than October 12th. 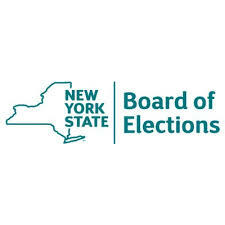 Persons who are unsure whether they are registered, or wish to verify their current address, may check their status at the State Board's website: www.elections.ny.gov. New Yorkers wanting to register in-person may do so at their county boards of elections and at many state agency offices throughout the state, but must do so no later than October 12th to be eligible to vote in the general election. For more information on registering to vote in New York State, call your county board of elections or 518-474-1953 or visit the State Board's website: www.elections.ny.gov.